At Barclay Autos we can carry out major repairs to all makes of vehicles. This can include anything from Cylinder head gasket replacement up to a complete engine re-build. Most main dealers would not consider rebuilding an engine and would try to sell you a complete new engine. We have invested in the specials tools and Technical Information necessary to carry out these major repairs to the high standard required. We offer a range of high quality new clutches from Europes leading clutch manufacturers. Clutch replacement can often be a complex task involving extensive dismantling of engine and gearbox components. It is important to get specialist advice before considering a new clutch as many symptoms, although indicating a clutch fault, may be due to something completely different. Dual Mass Flywheels for instance, are notoriously problematic and can cause many symptoms including vibration, noise and idling problems. Solid Flywheel conversions are now available for many vehicles. As Barclay Autos only employ qualified, experienced technicians we are able to install your clutch or flywheel to the highest possible standard. We have a complete tyre-fitting bay and can provide all makes and sizes of tyres from budget tyres to all the major brands. We can cope with all fitments including low profile and 4x4 tyres. If your catalytic converter or exhaust system becomes defective and requires replacing, Barclay Autos can provide top quality replacement parts at significant saving over dealer prices. This legislation enables the motorist to use any garage of their choice to service their vehicle without invalidating the manufacturers warranty. This is provided that original or matching quality parts are used and the service is carried out to the manufacturers schedule. We offer a choice of vehicle manufacturer or industry standard servicing schedules. Barclay Autos is a Valvoline Service Centre and we use Maxlife semi-synthetic oil as standard in all servicing. Where needed we use O.E. specification fully synthetic lubricants including Longlife, PD and Low Ash Content oils. Our full company name is Barclay Auto Electrical Ltd t/as Barclay Autos and when we initially started in business we specialised in Auto Electrical repairs and Vehicle Security. This involved fitting Alarms and Immobilisers, Car audio and other "comfort systems" such as Electric Windows and Central locking for many main dealers as these extras were not always available as a factory option on new cars. Over the years the market has changed dramatically (even the most basic of vehicle comes with these features as standard) and this is no longer the mainstay of our business. We can still install if required, but now concentrate on rectifying problems on all vehicle electrical systems. Being qualified Auto Electrical specialists we don't just "Re-gas" your air-conditioning system and hope this cures the problem. We can diagnose and repair even the most complex fault on your Air-conditioning or Climate Control system. We can also convert old R.12 systems to operate on the latest R.134 refrigerant. Barclay Autos is a Class IV approved MOT Testing Station. We offer MOT's by appointment only, however we can on occasion offer MOT appointments at short notice. A service that we can offer to fleet customers is to pre-check and present for test those vehicles that we cannot test ourselves. This includes Class 7 vans, Class 5 minibuses and even small PSV Tests at VOSA. We are also able to undertake the Maintenance and Safety checks necessary to comply with Operator Licence requirements. Did you know that you don't need to have your vehicle serviced at a Main Dealer even during its warranty period? In October 2003 European Union legislation affecting the Motor Trade came into force. Its full title is Block Exemption Regulations 1400/2002. All of the service and braking parts we fit are of original fitment quality and we have access to a wide range of parts direct from the original manufacturer. This means we can save you money on the dealer price for the same part. 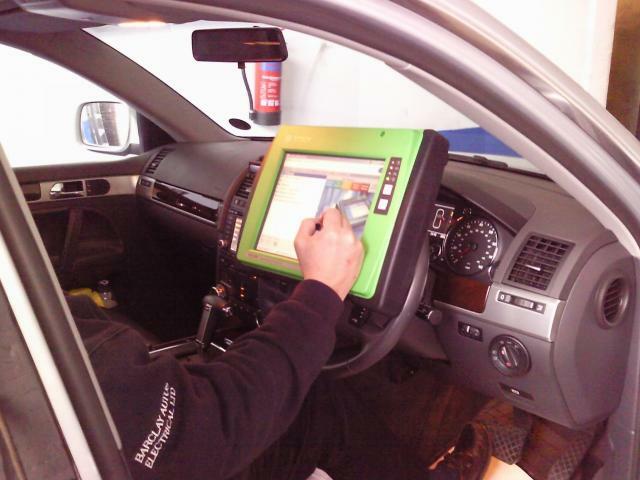 Barclay Autos has invested heavily in training and the very latest diagnostic equipment and technical information software that covers over 90% of vehicles on the road today. We can diagnose and repair faults on all electrical systems including Engine Management, ABS and Traction Control systems, Airbag and SRS systems and most other On-board Electrical systems. We don't just "code read" and replace related parts, but use digital meters and oscilloscopes to confirm initial diagnosis thus avoiding unnecessary replacement of expensive components.